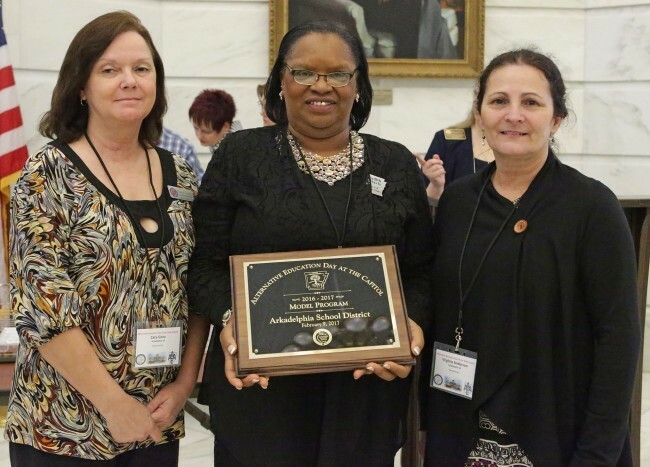 The Department of Education recently held its annual Leadership Day at the Capitol to celebrate successful Alternative Education programs and students in Arkansas. The Arkadelphia School District was one of two districts recognized as a model program in Arkansas. The Department of Education presented a plaque during the awards ceremony to three Arkadelphia representatives: Virginia Anderson, Director of Federal Programs and Administrative Services, Judith Davis, Alternative Education Coordinator, and Cary Goza, the alternative education teacher at Goza Middle School. Prior to being selected, Davis and Anderson worked together to complete four questions given by the Department of Education regarding the program’s success and student involvement. Arkadelphia’s Alternative Education program stresses the importance of getting involved in the community. Students actively volunteer at the local food bank and the Clark County Humane Society. They also recently began a project tracking and monitoring the construction of Arkadelphia’s river bridge. Davis received a call from Lorrie Lamb,Alternative Education Director at the Arkansas Department of Education, on Wednesday night informing her about the award the Arkadelphia School District would receive the next day. In addition to being named a model program, Kalia Brown, an eighth grade student at Arkadelphia Public Schools, received the Diamond Award during the ceremony. The Diamond Award was presented to twelve students that have demonstrated tremendous success. Brown transitioned into regular classes this year and has shown tremendous success. For more information about Alternative Education, visit http://www.arkansased.gov/divisions/learning-services/alternative-learning-environment.